In a Mid-State Conference Tournament semi-final victory Friday, Boone Central/Newman Grove followed the tenets of its program – defense and rebounding – to the letter. In Saturday’s championship game loss, the Cardinals did not. It was really that simple, according to Cardinal Coach Dan Zoucha. “We felt this was the best we rebounded and defended the entire season,” Zoucha commented after Class C1 #4 Boone Central/Newman Grove avenged an earlier loss to O’Neill with a gritty 44-34 win at Norfolk’s Northeast Community College. However, following a 74-63 loss in the Mid-State final to C2 #7 Hartington Cedar Catholic, which has now won 2-of-3 games between the teams this season, Zoucha rued his team’s efforts in those areas. 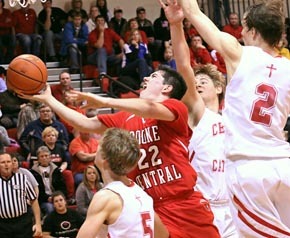 Boone Central/Newman Grove, now 16-5 in 2012-13, faces a pair of road challenges this week. The Cardinals traveled to Doniphan-Trumbull Tuesday and will play at Lutheran High Northeast in Norfolk Friday. Boone Central/Newman Grove actually opened play in the annual Mid-State Conference Tournament Tuesday, Jan. 29, with a workmanlike 47-36 victory over Guardian Angels Central Catholic. The Cardinals rode an 18-2 run in the second quarter, fueled by Beau Bremer’s six points and five by Tyler Hedlund, to a 25-12 halftime lead. After a sluggish third period, BC/NG wrapped up the decision behind Hedlund’s eight fourth-quarter points. Pierce Koch added five in that final period. From their previous meeting, Boone Central/Newman Grove knew O’Neill had players who could light up the scoreboard. Thanks to a stifling defensive effort, however, the Cardinals overcame an eight-minute point drought in the middle quarters to score a 44-34 semi-final victory Friday. Hartington Cedar Catholic likes to get up and down the basketball court. Boone Central/Newman Grove doesn’t mind running itself. That fast pace seemed to favor the Trojans Saturday, as they used several strong runs to race by BC/NG 74-63 in the Mid-State Tournament final at NECC. With center Grant Howell scoring six points in the paint and guard James Kaiser adding five from the perimeter, HCC used a 20-11 second-quarter blitz to take a 29-20 halftime lead. Trailing by 15 points in the fourth quarter and losing center Beau Bremer to fouls, the Cardinals showed their mettle. Tyler Hedlund, who scored 17 fourth-quarter points and 24 overall, led a furious rally that trimmed the deficit to 57-53 on his deep 3-pointer. BC/NG missed 3-point attempts on its next two possessions, however, and Cedar Catholic went on a quick 7-0 run to retake control.